2017-06-19 After setting up and taking down my ENO Doublenest hammock today I decided to go back to the Atlas strap and Carabiners. The weight difference is only 7.3 oz and the Atlas Strap is really easy to use. 2017-02-23 Today the Soft Shackles I ordered from whoopieslings.com came. So replaced the carabiners on my ENO DoubleNest hammock with them and then took it to the garage (It is chilly about 40 outside today) to see how they work. Bottom line is that they work. But I pretty well convinced myself that the hassle of putting them through a loop in the Atlas strap only to discover that they need to be moved to a new loop is not worth the 0.3 ounce saved by them per carabiner. I think I'll stick with the Carabiners and find some other use for the soft Shackles. 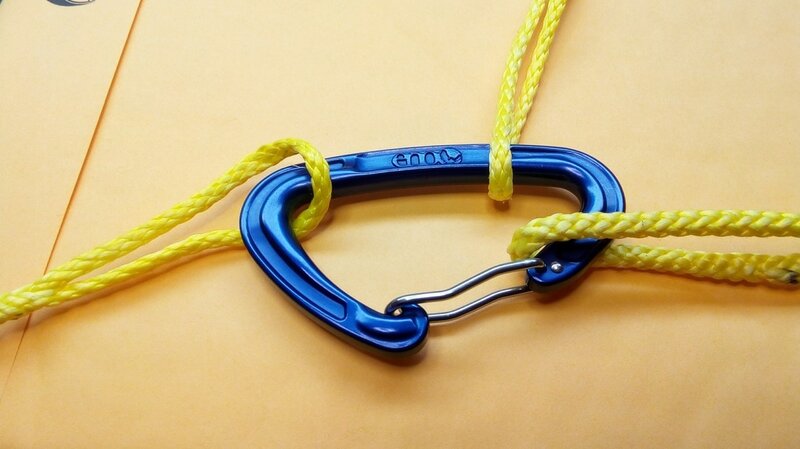 A soft shackle doing the job of a Carabiner. The Carabiner that came with the Snugpak Jungle Hammock (top) and the ENO one (center) between my first two DIY soft shackles. 2017-02-21 All three of my hammocks came with carabiners to attach them to the tree straps or ropes. I've replaced them on two of the hammocks with whoopie slings tied right to the closed loop on the ends of the hammock and then use toggles to attach them to the tree straps. On my ENO DoubleNest hammock I've kept the carabiners for now. They are really convenient for attaching to the Atlas Straps. But I'm fascinated by all sorts of things and the idea of soft shackles has caught my attention. Of course there are a host of videos on YouTube to show you how to make them. Two helped me with mine. One by Texas Bushcraft was very helpful. It was easy to see the overall procedure. He refers to one by John Franta from which I finally figured out how to tie the diamond knot. The two at left are the result, my first ever attempt. The one on the right is pretty small so may not be very useful. The one on the left is about perfect size. I don't trust either one so I ordered two from whoopieslings.com and will do my first hang using soft shackles with those. I've known about soft shackles for some time and thought about making or buying some several times. The thing that put me over the edge, besides my curiosity, is that many carabiners (not the ENO one in the center of the photo above) have sharp edges on the latch which are almost impossible to use without snagging either the tree strap or the whoopie slings or ropes that they attach to. That is especially true after you have hung your hammock and then try to add cords for your tarp or underblanket to the carabiner. And I feel nervous about snagged cords, especially those that suspend the hammock! The soft shackles look like a pain to put on and even more of a pain if you want to add anything to them once they are closed up. So we'll see. Regardless, they were fun to make. 2017-02-20 It has been very nice weather here in southeast Wisconsin the past few days and today was no exception, topping out at about 66 at my house. As I mention on my February 2017 Hiking/Camping page I hung my Walmart Equip Mosquito Hammock between two trees in the woods on the hillside above our house. It had a fixed structural ridgeline of Amsteel that I had made for it. It didn't seem all the comfortable so I removed that ridgeline. Wow, what a difference. I could get a nearly completely flat lay and everything just seemed less confining. So I'm still trying to figure out those structural ridgelines. Clearly the ones I've used so far are too short. They also seem to restrict the ability of the hammock to kind of reposition when you move around in it because the "hinge points" (I'm sure that is not a hammock term) are confined to just the length of the hammock instead of the whole length of the suspension. So, I'm not deciding permanently about structural ridgelines but so far I'm not settled on whether to use one and how to find the right length. 2017-02-07 Today the weather was still pretty nice so I took my ENO DoubleNest hammock to the garage and hung it specifically to play with the structural ridgeline. I had added a foot of Amsteel to the fixed loop end of the whoopee sling I was using yesterday so I could adjust it significantly. But no matter what length I chose the hammock seemed more comfortable without one at all. So I decided to try the same thing with the Snugpak Jungle Hammock with integrated Mosquito net. My conclusion? Forget the structural ridgeline! For now anyway. Perhaps once I have used the hammock in a variety of situations I will change my mind. 2017-02-06 From reading various comments on Hammock Forum and watching a lot of YouTube videos I concluded that I should use a structural ridgeline. So I have been doing that, using the recommended measurement which is 83% or something in that ballpark. Yesterday when I was playing with the Snugpak Jungle Hammock with integrated Mosquito net in my garage I noticed that it was quite easy to find a comfortable diagonal lay. In fact it seemed more comfortable than my ENO DoubleNest hammock. It has been bugging me why I thought that. So today I set up the ENO again. And much to my disappointment, again, it was not as comfortable as the Snugpak. That got me thinking about that structural ridgeline (which was NOT on the Snugpak). So I took it off. MUCH BETTER! It took a lot of contortions and creativity but I managed to measure the distance between the biners while I was lying in the hammock. It came out to 9 feet and 2 inches or 110 inches. My ridgeline had been about 89 inches! I may try a 110 inch one and see if that gives me a comfortable lay. I like the concept of the ridgeline as it should make the hammock feel the same regardless of other external factors. 2017-01-15 Atlas Straps vs. straps and whoopee slings: As I lay there trying to go to sleep last night I got to thinking about the advantages and disadvantages of Atlas Straps and strap/whoopee slings for suspending a hammock. Both work and work well. The primary advantage of the Atlas Strap system is ease of setup. You simply put the strap around the tree and clip the carabiner in one of the multiple loops. That's it. If you need to change the length of the hookup you simply move the carabiner to another loop on the strap. If that does not provide enough adjustment you have to move a tree! But the nine foot length of each strap with about five feet of loops to choose from allows for considerable adjustment. The strap/whoopee sling approach is slightly more involved. After putting the six foot strap around the tree, you tie a Marlin Spike Hitch and then attach the whoopee sling. ​To change length of the suspension you simply slide the whoopie sling. If that does not give you enough adjustment then you have to redo the Marlin Spike Hitch. My whoopee slings can be adjusted from about 9 feet to six feet. The straps, depending on the tree size can be adjusted around another three feet so both together allow for considerable adjustment. The primary advantage of the strap/whoopee sling approach is weight. Mine weighs 6 oz less than the Atlas Straps. That is not a lot but is a difference. That six ounces is probably offset by the ease of setup of the Atlas Straps most of the time. The bottom line is that both work very well and a final decision is likely based on personal preference. 2017-01-14 I see two problems with whoopee slings. One is that where the whoopee sling attaches to the continuous loop in the end of the hammock, the amsteel will become next to impossible to detach once it has been pulled super tight by hanging in the hammock. The second problem is that there is no easy way to attach a structural ridge line so that it could be detached or to allow for attachment. Of course a carabiner is one way to fix that. But one of the reasons for using a whoopee sling in the first place is to avoid the need for a carabiner. The one pictured below weighs 0.7 ounces and is metal! Neither are a big deal but sort of "violate" the purity of the whoopee sling solution! Carabiner used to join continuous loop from the hammock (right), structural ridgeline (top) to the whoopee sling suspension (left). At least one option is to use a soft shackle made from Amsteel in place of a carabiner. I found a lot of YouTube videos of how to make a soft shackle. The one I used is listed below. Junction between Amsteel continuous loop (yellow) and whoopee sling (gray). Knot is nearly impossible to undo after hanging in hammock. 2017-01-09 My first two hammocks, a Equip Travel Hammock, Blue and an Equip Mosquito Hammock, both from walmart came with 1/4 inch black nylon rope or cord for the suspension system. You simply wrapped that cord around a tree and tied appropriate (or in my case inappropriate, hard to untie) knots in the cord. The Eno DoubleNest hammock had similar cord through the gathered ends which looped through a carabiner which in turn clips onto their Atlas Straps. Right away I didn't like the nylon rope on the Equip hammocks as it was too short and I'm not much with knots. The ENO setup seemed perfectly good as the Atlas straps are long with lots of attachment loops where you can easily clip on the carabiners. Driven mostly by various YouTube videos and my dissatisfaction with the nylon rope I began having visions of tree straps, Whoopee Slings and Continuous Loops, along with Amsteel Blue. One guy who reviewed the Equip travel hammock (I'm sorry I can't find that review again) said the only mod he suggested was to replace the nylon ropes that were included with Amsteel Continuous loops ​and Whoopee Slings, and tree straps. I ordered straps and some Amsteel from dutchwaregear.com and made Whoopee Slings and continuous loops and replaced the ropes on both Equip hammocks with them. The three videos below were my guides. When I got the ENO DoubleNest hammock I made two more continuous loops and replaced the 1/4 inch nylon cord through the gathered ends with those loops. I don't know if that is better but was fun! Many people also replace the carabiners and Atlas Straps straps with whoopie slings. They usually attached the whoopie sling to the straps with a Marlin Spike Hitch using a toggle. Here is a video that shows how to do that.